Expressionist Painting of a Japanese Woman (2011) from Bali, "Japanese Lady with Flute I"
Hands raised in an elegant gesture, a lovely Japanese flutist prepares for a performance. 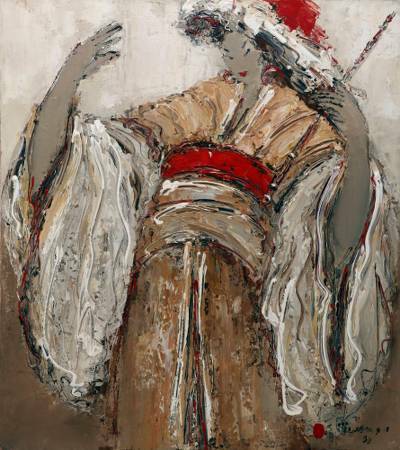 Balinese artist Wayan Suarjiwatman draws great inspiration from Japanese culture, painting this composition in a stunning expressionist style, using hues of beige, grey, and red with a palette knife to capture the elegant folds of the woman's robes. This elegant painting features a pleasing relief texture.